1961-62 Topps Hockey is reworked to better showcase the three NHL teams represented in it. At the same time, several new features were added. Card fronts feature a player image superimposed in front of a game scene, which gave an image that he was playing. A graphic image shaped like a puck in the lower right corner contained his name, position and team. 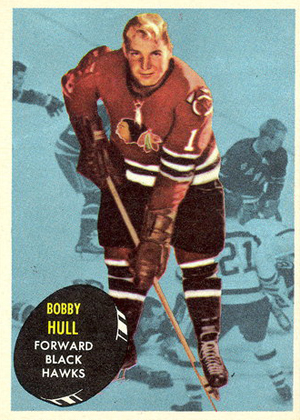 1961-62 Topps Hockey has a simple white border surrounding the card. Backs were printed with a red border that contained images of hockey players in action. A circle shaped like a hockey puck in the upper left corner contains the card number and the player's name, position and team extend across the top. The box inside the red border has a line of statistics from the previous year and a bilingual biography. The 66 cards in 1961-62 Topps Hockey are broken up among three teams, with each team getting its own section of the set. The Boston Bruins have cards #1-22, the Chicago Blackhawks are on cards #23-44 and the New York Rangers appear on cards #45-65. The last card of the set is a checklist, which is the first time one was included in a Topps hockey set. Each team is led off by its coach, on a card that has a rounded edge that looks like a television tube turned on its side. Rookie players have a similar design. Each team also has a team picture card and two action cards that appear at the end of each team's section. The action cards are designed to look like they're taking place on a television. Key rookie cards include Rod Gilbert and Jean Ratelle. 1961-62 Topps ROD GILBERT (RC) #62 New York Rangers EX EXMT Nice (HOF) LOOK ! 1961-62 Topps PAT STAPLETON (RC) #18 Boston Bruins EX EX+ Nice LOOK ! 1961-62 Topps Red Sullivan #48 New York Rangers EX-MT Nice LOOK ! 1961-62 Topps Junior Langlois #46 New York Rangers EXMT+ Nice LOOK ! 1961-62 Topps Dean Prentice #54 New York Rangers NRMT Nice LOOK ! 1961-62 Topps Camille Henry #56 New York Rangers EXMT Nice LOOK ! 1961-62 Topps Guy Gendron #57 New York Rangers EXMT Nice LOOK ! 1961-62 Topps Ken Wharram #30 Chicago Blackhawks EXMT Nice LOOK ! 1961-62 Topps Bob Turner #41 Chicago Blackhawks EXMT+ Nice LOOK !